Who can forget the magical feeling of waking up on Christmas morning, wondering what Santa might have left behind? When you have little ones of your own, you want nothing more than to share that same magic, wonder and joy with them. 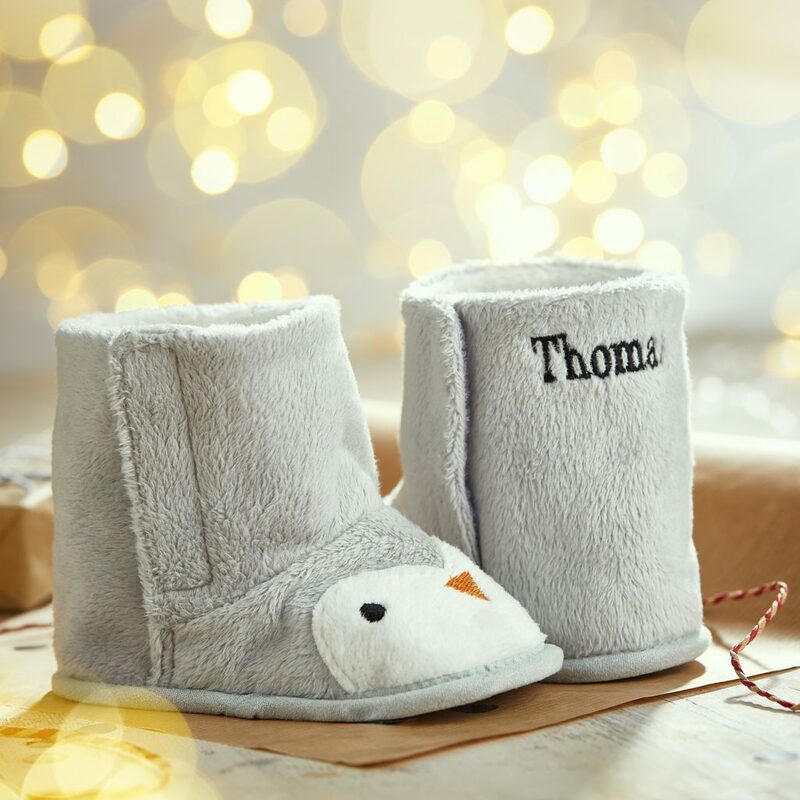 You’re always hoping to find presents and Christmas keepsakes that your child will love and cherish for years to come, even when they’re old and worn. These are not just a gifts or decorations, after all, but memories and traditions they can share with their own children when the time comes. Finding presents that are unique and unforgettable can be challenging, especially when you’re on a budget. You probably have one or two big presents planned out, but you want to add in a few little extras without inflating the cost too much. When you consider the decorations, the gift packaging and the party outfits, it all adds up pretty quickly. But don’t panic! My 1st Years is here to help. 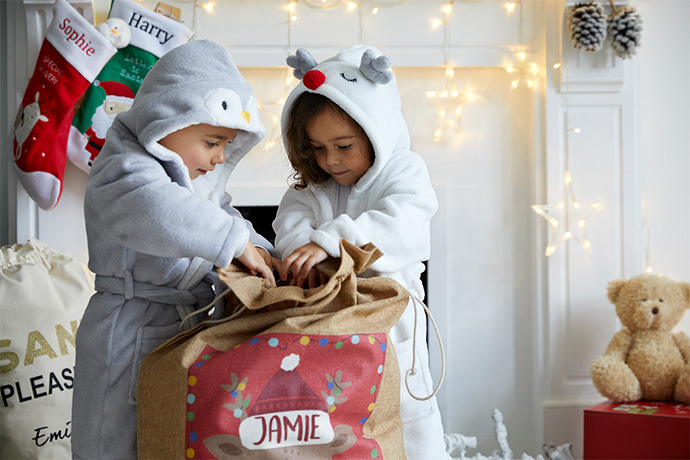 We have a gorgeous selection of personalised Christmas gifts and festive season keepsakes for children of every age. To make life easier, everything you see below comes in at £20 or less. 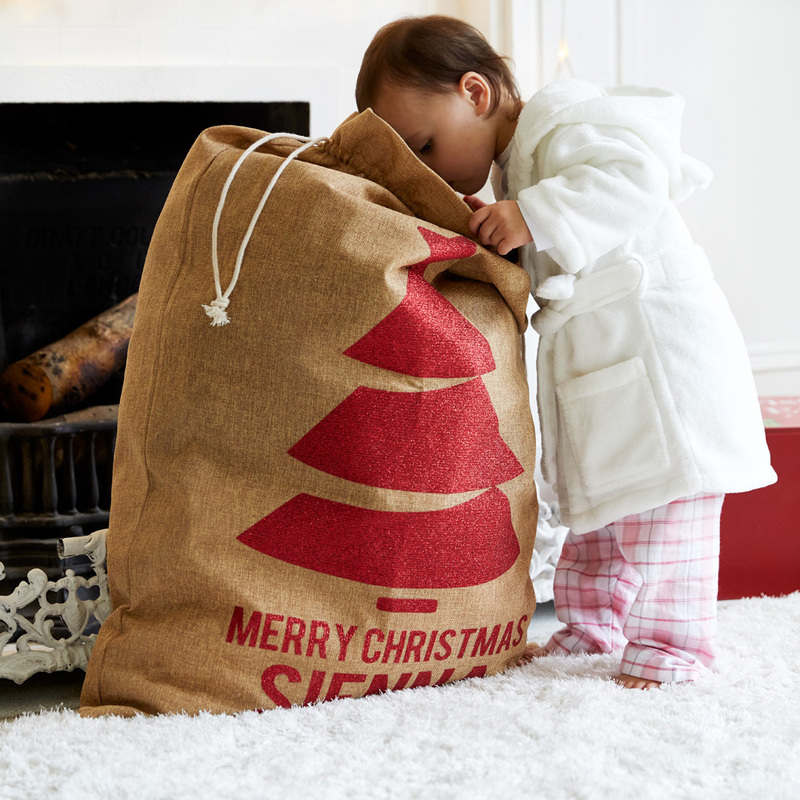 A cuddly, cosy comforter is an ideal gift for baby’s first Christmas. Our penguin comforter in winter grey is an adorably festive choice. It’s made from the softest fleece, so baby will always stay snuggled up warm and feel soothed enough to settle. Personalise your comforter with baby’s name, embroidered free of charge. Get baby dressed for the occasion with a personalised 1st Christmas bodysuit. We have a variety of different designs to choose from, including reindeer, stars, bears and even crackers for your little cracker. You can also have your choice of Christmas colours, from snowy white to Rudolf red with sparkly silver. There’s a reason teddy bears have been a favourite Christmas gift for over a hundred years. Teddy becomes your child or grandchild’s closest companion and first best friend. Let them have a one-of-a-kind bond by ordering a personalised teddy bear, embroidered with your little one’s name. 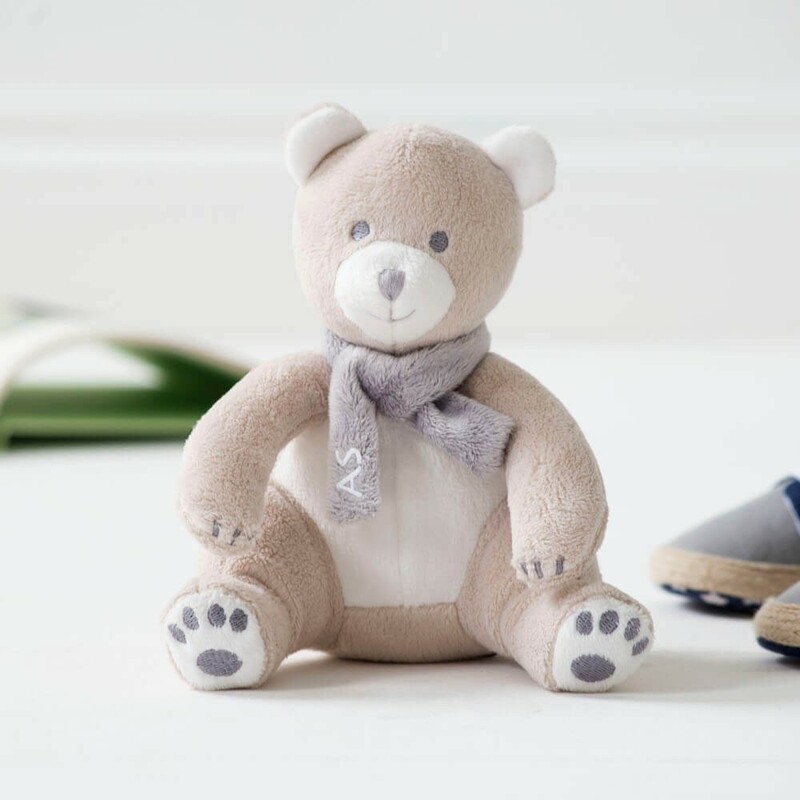 Our miniature Arthur bear is suitable for newborns and comes in at just the right size for cuddling in the crib. If it’s their first Christmas standing on two feet, they’re going to need a pair of booties! We love this pair of grey penguin ones with adorable penguin face and personalisation. These chic grey deer print booties, meanwhile, are versatile enough to be worn all winter long. Make them extra special by personalising with your little one’s initials. We also carry smaller versions for babies who aren’t quite at the walking stage yet. 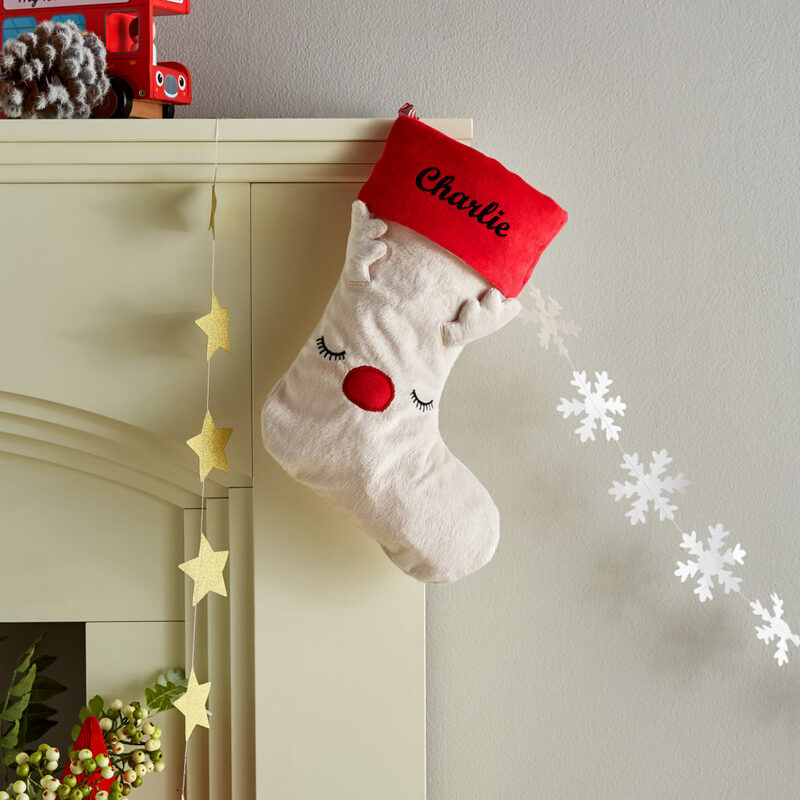 Once they’re old enough to understand what Christmas is all about, a personalised stocking becomes essential. It will see them through many a future Christmas and perhaps all the way to adulthood. Our stockings are all lovingly embroidered and appliquéd, so you can be sure they’re built to last. Would your favourite person prefer the Santa version or the snowman? And don’t forget a personalised Christmas gift sack for those bigger presents! Wooden toys will be appearing under more and more trees this Christmas, as more parents realise their many benefits. They’re a sturdy, environmentally-sound choice that encourages interaction in physical space rather than leaving your child glued to a screen. 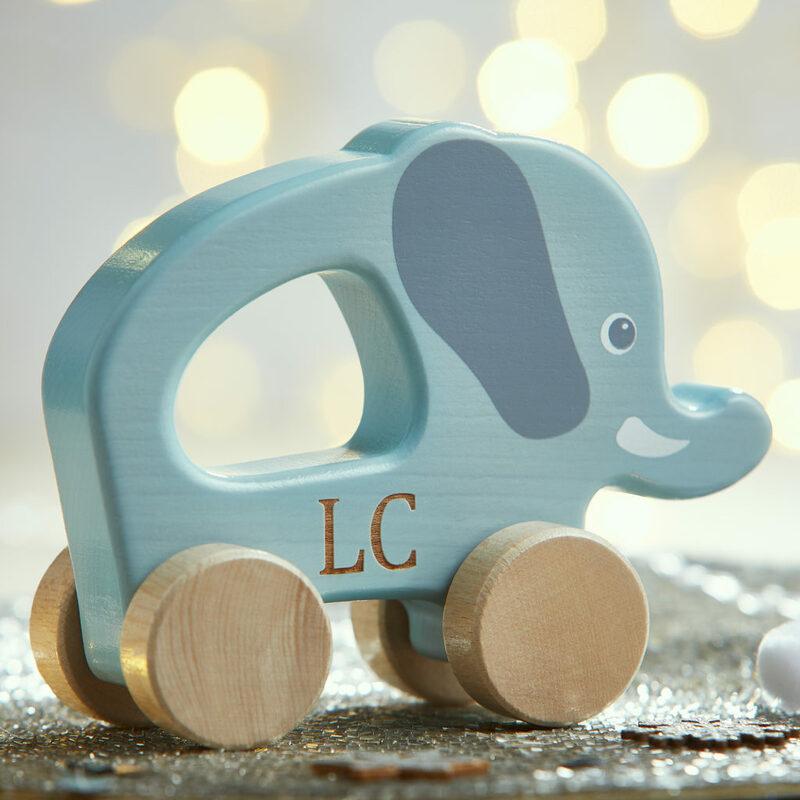 This beautiful elephant pull along toy will have your toddler running around in fits of glee well after Christmas. By the time children are reading and writing, they’re ready to engage with those special traditions that make Christmas unforgettable. It’s a blessing for mums, dads and grandparents to share these moments with their little ones, working on projects and making memories. Decorating the tree, for example, becomes even more fun when you make the baubles yourself! Our paint-your-own reindeer bauble even comes with a set of paints, ready and set for getting creative. Sharing the story of Santa with wide-eyed little ones is a joy for all parents, and it’s even more fun if you can bring the story to life. 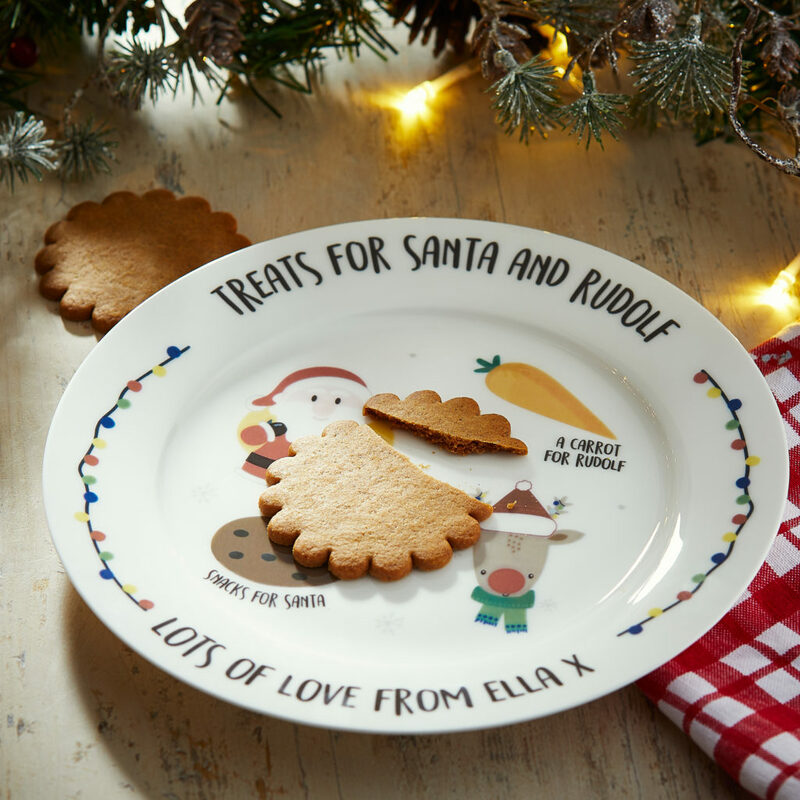 Deliver them their own personalised letter from Santa, or gift them a personalised plate for cookies and carrots on Christmas Eve. Just don’t forget to eat them all up before the morning comes! Our generous children not only love receiving gifts at Christmas, they’re also excited to give gifts to others. It’s always a lovely sight to see a little one bursting with pride as they hand a present to Mummy or Daddy. Help them pick out and personalise their own gift to surprise a parent or grandparent with. 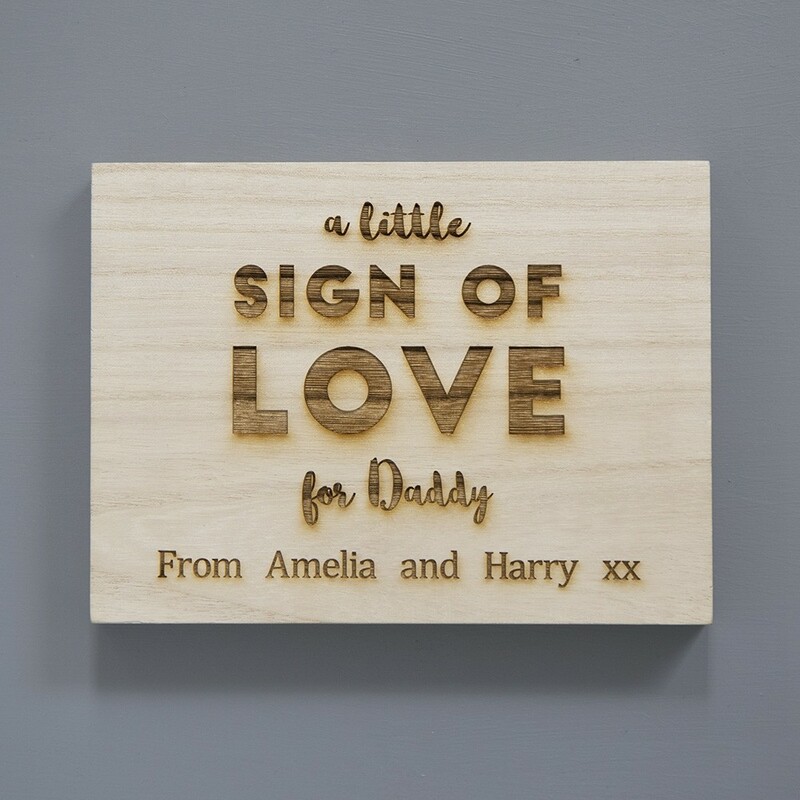 This adorable sign of love, for example, is sure to take pride of place on Daddy’s desk. 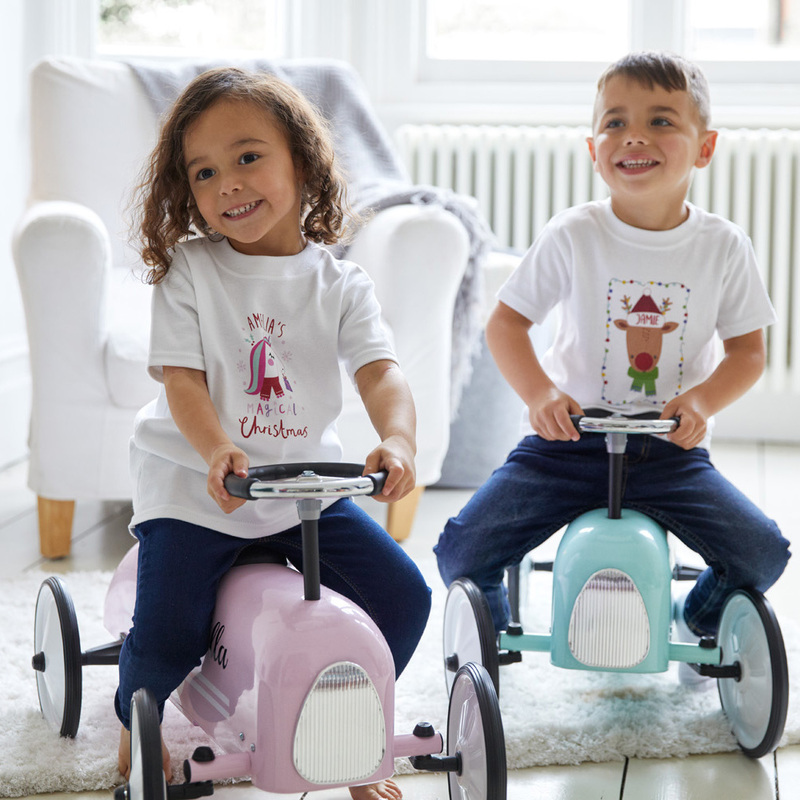 Explore the entire My 1st Years Christmas Collection for more precious, personalised gifts to suit every taste and budget.